Mick Walls' 2008 book W.A.R. 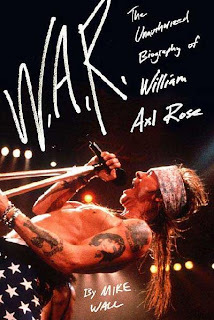 : The Unauthorized Biography of William Axl Rose determines that the Guns N' Roses' leader's genius stems from his small-town Indiana origins and the fact that he is just "a little guy" who "comes from nowhere." Walls was an insider with the band and frequently hung out with Axl's equally hickish brother Stuart, who we know is a hick because he's never heard of "egg cups." The only person Walls is not an insider with is Axl himself. Indeed, Axl, in the out-of-control lyrics of "Get in the Ring," from Use Your Illusion II, accuses Walls of printing journalistic lies. This book would probably be better if it were "authorized." There are some good stories here, like the one that put Mills in Axl's doghouse. It entails a rant about Motley Crue's Vince Neil claiming to have punched out GN'R guitarist and Axl's only remaining friend from the original lineup, Izzy Stradlin, for "messing" with Neil's mud-wrestler wife. Neil tried repeatedly to coax Axl into a fistfight, but Axl continuously "chickened out." I think I'll hold out hope for a better GN'R book. Like this one, by Stephen Davis, who wrote THE book on Led Zeppelin, Hammer of the Gods.